Pint O' Comics » G.I. Gary’s Toy Tales: Raise The Khetanna! 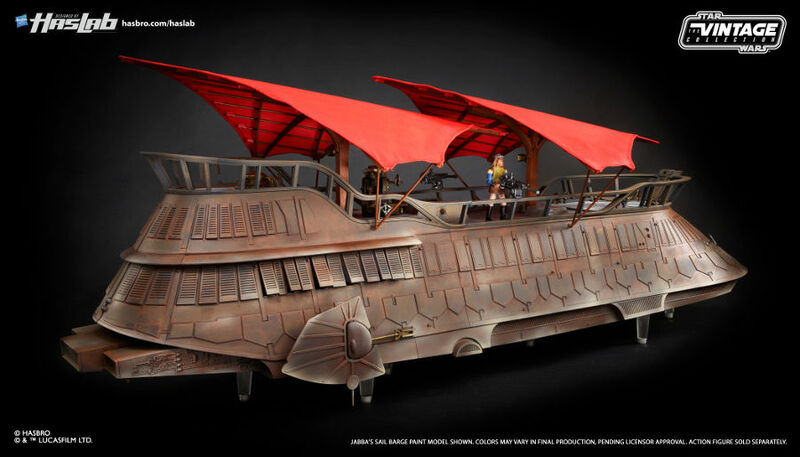 As of midnight, April 4, 2018, Haslab’s first project, Jabba’s Sail Barge, a.k.a. the Khetanna, had succeeded reaching 8,810 orders of 5,000 needed to begin production. This is Hasbro’s first foray into the crowdsourcing environment, and being that the IP represented was Star Wars, the most well known project of this type so far. At the mid February launch, there was the initial spike of backers. From then on, it was a slow march towards 5000. As March came to a close, 5,000 people backing the project was achieved under the wire on March 30th. After the news broke out that the Khetanna was officially a go, 76% more orders were achieved in 4 days. It took almost 6 weeks to reach 5,000, and 4 days for the other 3,800. But what does this mean in the greater scheme of things for the toy industry? Well, the initial reaction is that the toy companies are going to go after a more focused approach. As of late, the industry has been in a slump, with the major players Hasbro, Lego, and others reporting slowing sales. The slowing sales is a result of many factors. Distributors making smaller orders, fewer distributors (RIP Toys R Us), and also a general decline in toys amongst older children. In an effort to mitigate risk, Hasbro has created Haslab, similar to what Mattel did with MattyCollector. Haslab presents a win-win scenario for Hasbro. While Haslab is called “crowdsourcing,” it’s really a marketing spin using a buzzword to attract pre-orders. They are charging everyone up front, exactly what I would expect from a manufacturer. Don’t reach the amount of pre-orders? The orders are refunded. Insurmountable problem during the production? The orders get refunded. Hasbro delivers the product that the “backers” ordered? Everyone wins. But in this age of fandom there are people critical of this project. Detractors will point out the afformentioned MattyCollector that often wouldn’t deliver on projects, dissapointing fans. They will also point out that the Khetanna isn’t expected to ship for almost 1 year, keeping your money in their bank, earning interest. Hasbro has also been known to ship things with minimal protection with the the sleeve case not properly protecting the cardboard toy box. The toys inside are not damaged, though. Another factor was that Hasbro was only allowing sales in the United States and Canada. Fans outside of North America felt angry at being left to the secondary market. The truth of the matter is Hasbro is the only licensed toy manufacturer for Star Wars toys. The only way the Khetanna was ever going to get made was if they did it. Yes, they’ve proposed the project in the past, but they didn’t feel confident enough in the endeavor. Figuring out how to minimize risk was key in this project, and the other circumstances surounding this are opening eyes to what this may mean for the future of toy collectibles. The first benefit is being able to charge a retail price for a product without distributor in the middle. With the hefty 20% licensing fee, Hasbro is netting approximately $400 from each sale. Next is knowing that they will sell every unit they make. There won’t be factory over-run, and if there is it will be very minimal, so that will keep costs down. Also, when the minimal pre-orders are met, additional orders are going to net a greater percentage profit. Perhaps the biggest thing that Hasbro learned is that people are willing to get behind an idea like this. This will mean that other projects will be proposed. And other toy companies are looking at this and will attempt similar business models. The secondary market for the Khetanna still remains a huge question. Because this was marketed as an exclusive, there will be toy scalpers selling their extras at an inflated price. But of the 8,800 sold, will there be a glut in the market and will pricing eventually settle below initial sale price? Either way, Hasbro has won. It will be interesting to watch what the next collectible will be. Will it be another Star Wars item or one of Hasbro’s own IP like G.I. Joe, or Transformers, or even Mr. Potato Head (why not?). I did not back this project. I don’t have a desire for the Khetanna or Star Wars toys in general. This is an interesting concept, but will Hasbro’s execution of Haslab be successful enough to sustain itself and make collectors forget about the failed MattyCollector? And of course, selfishly I wonder what G.I. Joe products may be on the horizon.